Syringa oblata growing shrub‎ to small tree of the genus Syringa also known as Early blooming lilac, Syringa oblata perennial deciduous used as ornamental fragrant hedge plant and also as cut flower, can grow in temperate, mediterranean, subtropics climate and growing in hardiness zone 3-9. Flower fragrant color can be lilac (purple), pink or white, flowers grow in cluster on stems. Syringa oblata, purple flowering EarlyLilac/Chinese Lilac, 50 plant seeds. Syringa oblata, purple flowering EarlyLilac/Chinese Lilac, 25 plant seeds. Syringa oblata, purple flowering EarlyLilac/Chinese Lilac, 10 plant seeds. 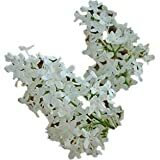 Syringa oblata, purple flowering EarlyLilac/Chinese Lilac, 250 plant seeds.